Soup Bros, photo courtesy of Yelp user Gina S.
The Soup Brothers have been in Milwaukee for over 20 years and they serve soup so good that “Warhol would have eaten it, not painted it,” as one of their signs on the wall says. The vibe, the music and the eclectic design of the whole place is offbeat, but warm and inviting, like any good soup establishment should be. The menu always has a few different broth-based and cream-based soups that are always served with a slice of delicious and warm sourdough bread. 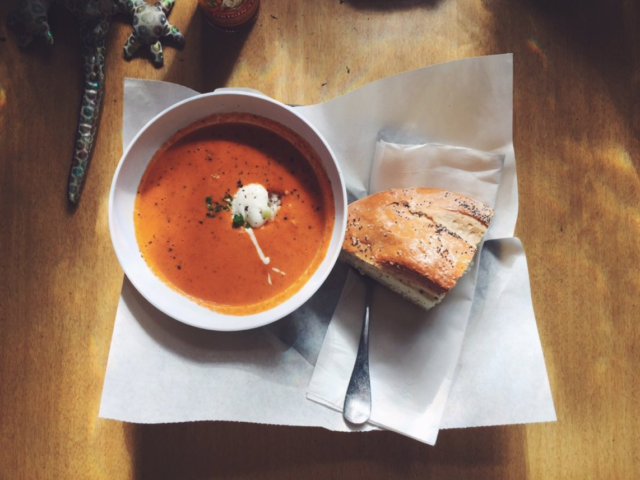 The fire-roasted red pepper bisque is a favorite (especially Ann’s favorite). And I prefer the Mario’s Barrio stew. It’s not always on the menu though, which should be a crime. Just because it doesn’t have soup in the name doesn’t mean they don’t have good ones. Amaranth Bakery specializes in whole-grain breads and pastries, but their soups are just as carefully crafted. With a wide variety of flavors like peanut sweet potato, Turkish lentil, borscht, shrimp vegetable curry and a potato-kale with Italian sausage, you won’t be disappointed. This retro diner is for the mom’s-pot-roast-loving crowd, which is just one of the great soups the restaurant serves. Soup Otzie’s other daily specials vary from creamy corn chipotle, beef barley and Thai curry. Benji’s Deli is a classic Jewish diner that serves classic grandma comfort soups that never get old, like matzo ball, sweet-sour cabbage borscht and the “mish mosh,” a chicken broth soup with matzo ball, noodles, rice and kreplach (meat-filled dumplings). You’ll want to get to this lunch spot by noon if you want a bowl of the best-selling buffalo chicken soup or seafood gumbo. Or, get the jasmine rice or noodles with tikka masala. And bring cash! The Soup House doesn’t accept plastic. Three Milwaukee restaurants – Amilinda, The Tandem and Tricklebee Cafe – want to highlight some of Milwaukee’s refugee communities’ cuisines with a new pop-up dinner series called Tables Across Borders. The series will feature cuisines from Syria, Serbia, Congo, Ethopia and more. There will even be a dinner featuring Rohingya cuisine, whose Milwaukee community has the largest number of Rohingya refugees in America. There will be six dinners that will be located at the three restaurants. Check out the schedule here. 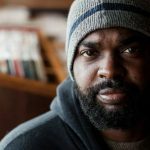 Author Michael Twitty is coming to Milwaukee on his book tour for “The Cooking Gene: A Journey Through African American Culinary History in the Old South,” which won two James Beard awards in 2018 for Best Food Writing and Book of the Year. On February 18 at the Mitchell Street Library, he’ll be giving a talk on culinary justice and the African American impact on Southern foodways and the complexities of his identity as a gay, African American, Jewish man. Then February 19 at The Diplomat, he will be the guest of honor at the Tase of the South dinner, a meal to honor journeys through Afroculinaria. Dane Baldwin, Linda Burrell, Jennifer Casey, Zakiya Courtney, Caitlin Cullen, Michael Easterling, Jarvis Williams and Venice Williams will cook up a feast celebrating regionally and culturally diverse Southern foodways. Get more info on that event here. Ann just discovered and fell in love with this “Moonstruck”-esque Italian hideaway in Bay View. It’s the kind of place that when you walk in, the owner will give you a warm greeting and you’ll feel like you stepped into Italy. And the atmosphere has an authentic menu to match with a bocce ball-sized meatball appetizer, Pisano pizzas, saucy old-school Italian-American dishes and Mama Galati’s Italian cookies to top it all off. You can check out Ann’s full review of Santino’s in the February issue of Milwaukee Magazine or try it for yourself. We’re in the middle of the coldest days of winter. What better excuse to talk about the best soups in Milwaukee? That’s what Ann wrote about in this month’s issue of Milwaukee Magazine. Read more and listen to the podcast below to hear more about some hearty soup joints in Milwaukee, Tables Across Borders, Michael Twitty’s Milwaukee events and a review of Santino’s Little Italy.